Complaining about the refs is generally a waste of time, but it’s impossible to overlook some questionable officiating that swung Game 1 in the Warriors’ favor. Complaining about officiating is so fundamental to the NBA playoff experience that it's usually easy to ignore. Referees make bad calls because basketball is impossible to officiate, and fans who love basketball will generally go insane when those calls hurt their team. It's part of the background noise that comes with every big playoff game. And just about every time, whenever fans are complaining, the outrage is misplaced. Whether calls weren't as egregious as they seemed or weren't as significant as you thought, the general rule is that focusing on the officials is a waste of time. And then there was Game 1 of the NBA Finals. Focusing on the officials in Thursday night's Warriors–Cavs game is unavoidable for a number of reasons. Most importantly, the Cavs themselves were very clear about what deserves the most focus coming out of that game. "To do what he did tonight," Ty Lue said of LeBron James after his team's 124-114 overtime loss, "and come out robbed... it's just not right." Lue isn't wrong. What LeBron did—51 points, eight rebounds, eight assists—was incredible. He hit from everywhere on the floor for Cleveland—lofting in threes, hitting runners in the lane, finishing through contact. He did it all. Even if the Warriors were always going to go on to win the series, LeBron beating this Golden State team, with that performance, would have been the sort of game we talk about for 30 years. It was just that good. Every time the Warriors jumped out to seven– and eight–point leads and Oracle began to sound like the inside of a jet engine, LeBron and the Cavs calmly fought their way back into it and somehow evened things up. Cleveland was down one in the final minute when LeBron absorbed a Kevon Looney foul and finished an absurd lay-up at the rim. That gave way to a three-point play and a two-point Cavs lead. And this is where the controversy began. Then the referees reviewed the play, as there's a provision in the NBA rulebook which allows officials the chance to review charges called in the final two minutes of the quarter, provided there is question about whether the player was inside the restricted area. So the refs wanted to double-check LeBron's foot-placement. "We were told they were reviewing if I had my feet outside the line," LeBron said. "And when I knew that, I was like, 'Okay, that's going to be our ball.' I knew I was outside the charge line. We were over on the sideline, drawing up a play, you know, to try to execute, try to go up a couple possessions." But then the refs overturned the charge altogether. 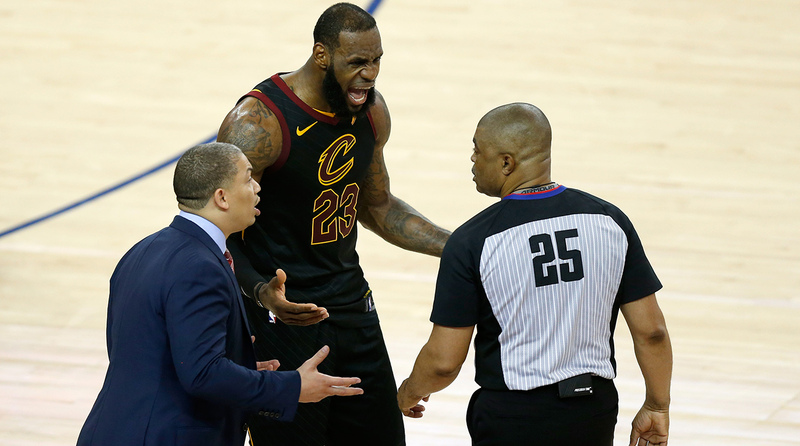 LeBron's feet were outside the restricted area, but the provision for reviews triggered by restricted area questions in the final two minutes also gives officials that ability to change the call itself. And upon watching the play in slow motion, the refs saw that LeBron was moving when he made contact with Durant. It was ultimately the right call, but in any other setting, officials can't overturn a foul call made in the course of live action. Hence the Cavs' dismay. Overturning the call meant that instead of giving Cleveland the ball up two with 35 seconds to go, Durant got two free throws. And rather than Cleveland getting the chance to make it a two-possession game, Durant tied the score, and the teams continued going back and forth for another two possessions. The fourth quarter ultimately ended in mistakes from J.R. Smith and George Hill that pushed the game to overtime, where the Warriors dominated. "I guess the rule is," Ty Lue said of the block-charge fiasco post-game, "You can review... you can review the call if it's inside or outside the restricted [area] is the rule that I know. And I mean, they called a charge, right? And LeBron was clearly four feet outside the restricted area. The review is if he's on the line or if he's close to the charge circle. That's the review. He wasn't close. So what are we reviewing?" Clarity on blk/charge review: The trigger is that if in the last 2 minutes of the 4th or overtime officials have doubt whether the defender was in the restricted area. While reviewing, they may also confirm if the defender was in legal guarding position when the contact occurred. "We had doubt as to whether or not James was in the restricted area," said official Ken Mauer of the initial move to review. Then, "When over at the table, we are then allowed to determine whether or not he was in a legal guarding position. It was determined he was out of the restricted area but not in a legal guarding position prior to Durant's separate shooting motion. So we had to change it to a blocking foul." Parsing the robotic language of referees and NBA rules is part of the reason it's usually not worth the trouble to dive deep into NBA officiating protests. This isn't why anyone watches basketball. But this episode was particularly frustrating because of the stage, the characters involved, and the rule itself. If the Cavs are upset—"Ken Mauer f***ed us" was a locker room theme—they should be. The rule is bizarre—all non-flagrant contact fouls are left to a referee's judgement and deemed unreviewable, except in this specific instance—and even the apparently correct application prompts a double take. Did the refs really not see that LeBron was at least a foot outside the restricted area, or were they responding to an apoplectic Oracle crowd by utilizing this bizarre loophole? This also wasn't the only time the officials raised eyebrows Thursday night. There was a sequence earlier in the fourth where LeBron was called for a foul on what looked like a clean strip of Kevin Durant. On the next Cavs possession, it appeared LeBron was fouled, but it wasn't called and led to a turnover. "Tonight we played as well as we've played all postseason," LeBron said Thursday. "We gave ourselves a chance possession after possession after possession. There were just some plays that were kind of taken away from us. Simple as that." Going forward, there are other ways to spin this discussion. For one, between zapping away momentum and creating controversies that otherwise would never exist, replay in sports generally detracts from the game as much it as adds—Game 1 is another example. Also, there may be cries of conspiracy from certain fans, but it should be noted that it was absolutely in the NBA's best interest to see Cleveland win this game. Finally, to be 100% clear, the officials technically made the right call on the Durant/LeBron block/charge. As noise about the refs intensifies, I'm sure that for many people the correct end result on the Durant call will be all that matters. More than anything, it's just a bummer to be talking about officiating at all after everything that happened Thursday. Coming into this series, almost every basketball fan in America was rolling their eyes at the thought of doing this for a fourth straight year, but Game 1 was a classic. The Cavs were incredible all night against a Golden State team that's as incredible as any team we've ever seen. Even if Cleveland goes on to lose in five, this could've been like Iverson vs. the Lakers, the game that ultimately matters more than the entire series. LeBron was in Hall of Fame mode, and Steve Kerr correctly pointed out that he's "playing basketball at a level I'm not sure anyone has ever seen before." Then an inexplicable call changed the complexion of the final minute, J.R. Smith and George Hill failed to close, and a classic turned into a blowout in overtime. This should've been a game that everyone looks back on fondly. It may be a game that everyone remembers bitterly.